We questioned ourselves on this new ideology De Stijl was confronting itself with in the early 1920s. One of them being the notion of inside and outside in architecture. As we found out by researching aspects of the Stijl after viewing the exhibition « Architects and Interiors » in the Gemeentemuseum of the Hague, there is a significant new way of looking at architecture in that period of time. Architects wanted a style that was more connected with their own time and ideology, traditional architectural rules were no longer significant. When we look at the scale models of the Maison d’Artiste by Theo Van Doesburg and Cor van Eesteren , designed in 1923, we can see the transition of walls that flow from inside to the outside. Trying to dissolve lines but also creating a way to incorporate the outside into the building. An interesting factor at the time was the creation of big windows and the opening up of space, which created a deeper connection to the exterior. Another example from around the same time is the Schindler House built in 1922 in Hollywood. 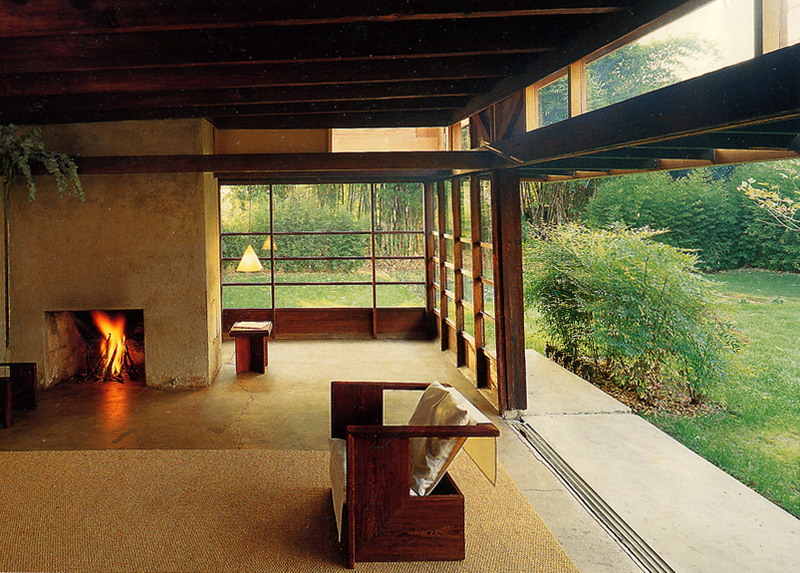 By creating a massive wall that can be opened up between the garden and the living room, Rudolph M.Schindler created a space that can connect the inside with the outside. 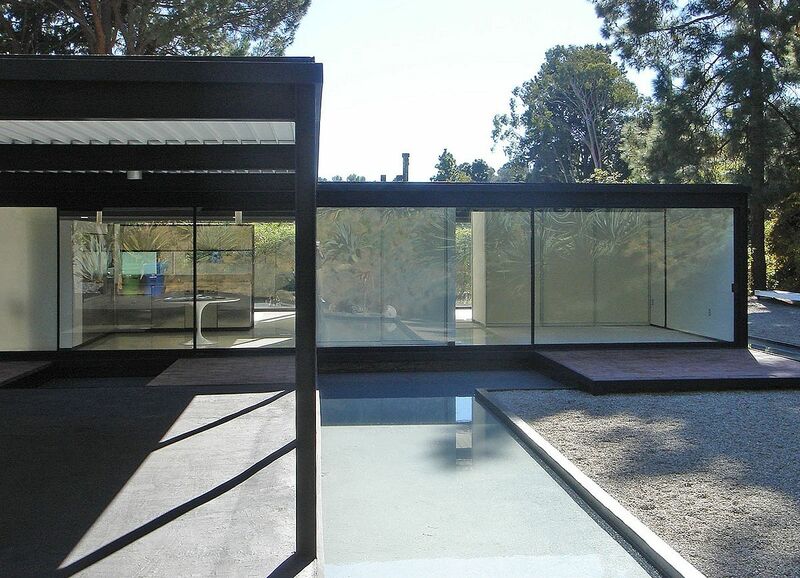 Our next lead took us to the Case Study House project (1945-1966). A project consisting of 36 planned houses that were published in the Los Angeles based Arts & Architecture magazine. After the second world war there was an advance in technology and material. Architects worked together with the magazine to create new ways of seeing and constructing liveable homes during the population boom at the time. Even though not all houses were actually build, these plans were a hot topic among American architects. These houses were characterised by flat roofs, glass walls, modular design and steel frame construction. They neatly integrated into the sites with an emphasis on indoor-outdoor living. One of the first examples that can indicate a fusion of inside and outside is the plans for the Greenbelt house, where the architect tried to create an open space in the middle of the house that could be used as a place to store crops and other vegetation. Another project is the #21 case study by Koenig, where an irrigation system that surrounds the steel construction helps cool off the house itself. The design emphasise harmony of materials and balance between interior and exterior through the use of terraces, water, glazing, and skylights. Many more of these projects were about the connecting and fusing of the outside with the inside. Elizabeth Smith, Chief Curator of the Museum of Contemporary Art in Chicago, talks about this combining of inside and outside elaborately among other subjects in this lecture. If we look back in time, structures that connect the inside with the outside have already existed for a long time. 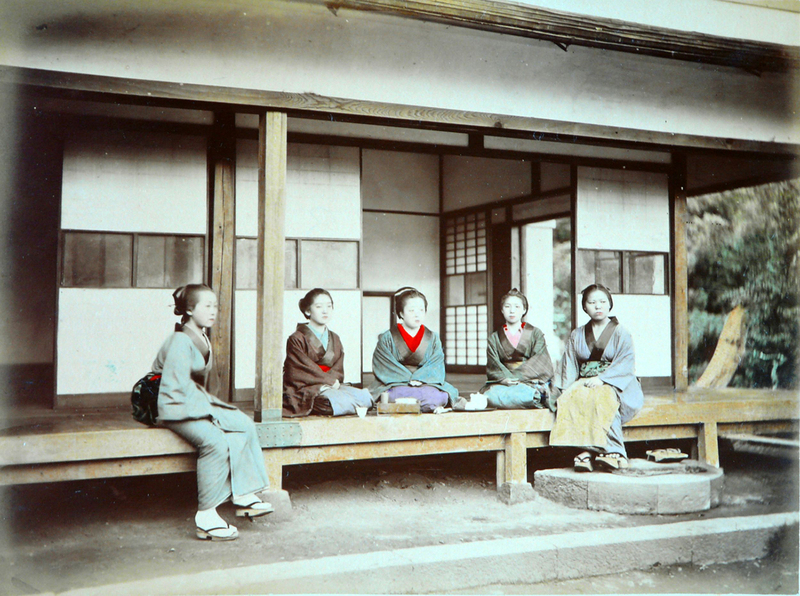 We can take the example of the engawa in Japan, having the entire house surrounded by a ledge and being able to open up all doors and windows creates a connection between inside and outside. Recreating these structures and ideas. It’s almost like there was a necessity to be out in the open again in the 1900s and after. Today we can still find traces and marks of this ideology strongly present all around us in our contemporary world. What is being outside? What is being inside? In recent architecture we can find a lot of traces leading back to this ideology of bringing outside and inside together. Big windows for example are still a highly used aspect in a lot of houses. However, not all modern houses really look into the effect of this blending of an outside and inside. And there also seems to be a genuine difference in houses that have the the possibility of indoor and outdoor blending and houses that are created for the soul purpose of bringing the outside inside continually. Let’s compare this difference by first looking at the OZ House by Andrade Morettin Arquitetos Associados. The house is made, similar to some of the Case Study Houses, out of a concrete framing that holds the big windows and walls. The south facade of the house made of glass opens up all interior areas allowing it’s openness to the views of the surrounding vegetation. It has the possibility of creating an outdoor/indoor connection by opening the doors, so it may or may not use it’s features. This way you are not limited by the outside forces, they can be ignored by isolating the house from them (closing the connection). 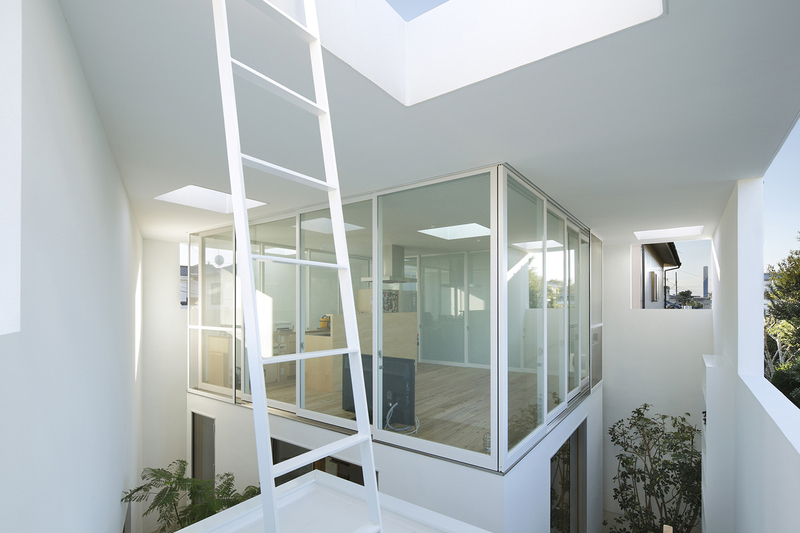 A great example of a house that tries to bring the outside in continually is the Inside Out building by Takeshi Hosaka. Intended to create a house for two cats and a human couple, the house was not focused on the human perspective alone. In this house there is only a few spaces that are able to be closed off to the outside, the rest of the building is open and connected to the wind, rain and sun. The ones living in the house have to adapt and live with these weather conditions and live accordingly. So in this example the outside has taken it’s place as a constant force inside of the building. The occupants have only one room (the living room) that they are able to control. Another less extreme house that takes the outside in is Casa Ilhabela by Studio MK27. By creating privacy around the house using walls and plants, they created a situation where they were able to take out the walls of the lower level and create one big space that is inside and outside. This space is a living room, but also a garden area. 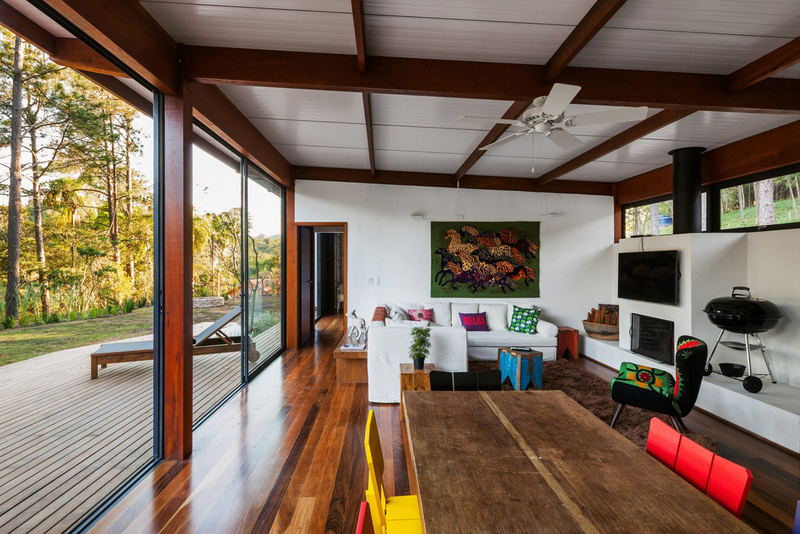 Having some outside forces, predominantly temperature and weather, continually coming through the living room makes this another example of a house that is bound to the outside. However on the first floor of the building, there are bamboo shutters in front of the balcony areas that can be opened up. Together with a pair of doors that can also open up the first floor to the outside. Having the possibility to also have an outside/inside connected space on the first floor. This house is balanced between the concept of a continuous outside in the inside and a possible outside in the inside. Designers, architects and artists are also questioning the idea of bringing the outside indoor by bringing the nature into the interior space, incorporating scenes of nature. This transition with the natural world blur the lines and barriers between inside and out. Bringing trees and other elements of nature inside, these projects question what is possible within the confines of erected walls. 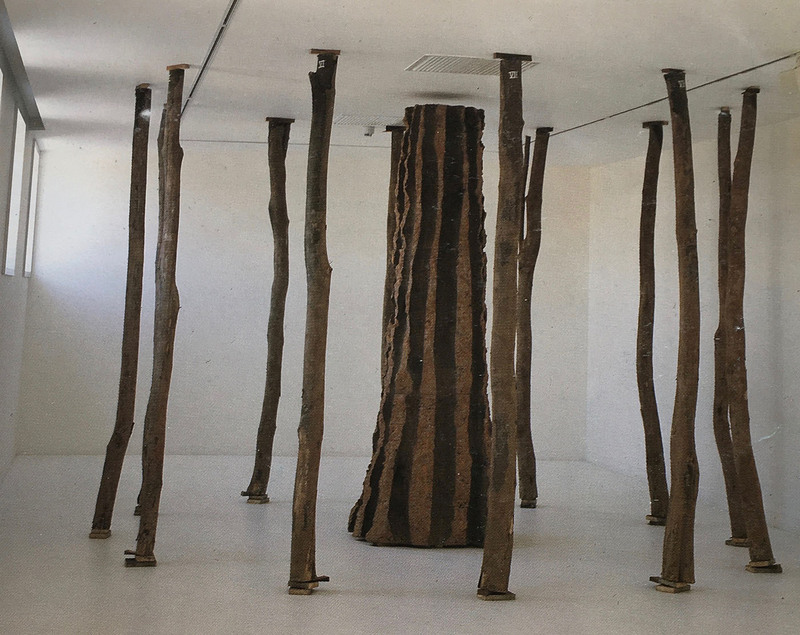 The artist Jean-Marc Navez incorporates trees that reach the ceiling and occupy the whole space to underline the bringing of outside into an indoor space. Through the incorporation of indoor trees the divisions between the home, office, landscape and environment are blurred. Up to now this article has been about building houses and bringing whatever is outside of those buildings inside. But there are also lots of houses that are build to be enveloped by nature, by building into already existing structures like mountains, hills and trees. These give you a feeling of literally living in the outside. Some of these houses also have the ability to use their natural structure to create effects in the inside of the house. Sometimes they can control warmth or certain weather effects. 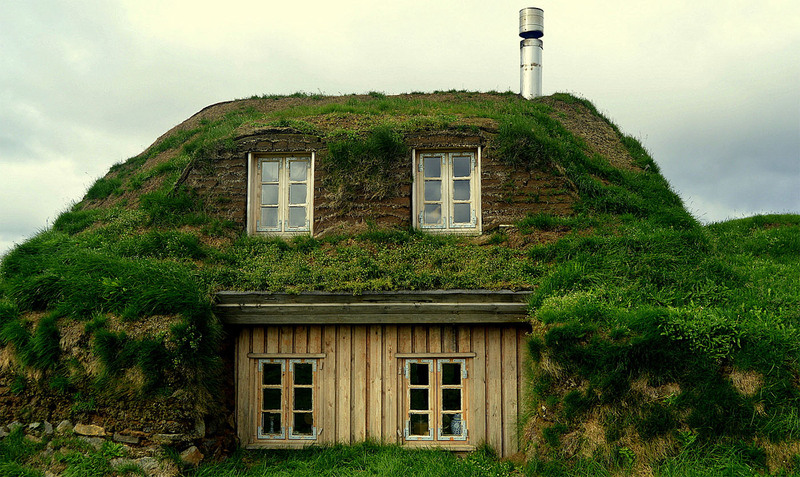 For example earth sheltered homes like the Icelandic turf houses, are build into a hill to ward off cold winds. They also use turf to build thick layered walls that can keep the warmth inside. This technique of holding warmth is a great example of how to be sustainable. This aspect of sustainability and our carbon footprint are quite popular and important in our most recent history. From this thinking comes a new way of creating houses, so called eco-houses. Here is a small video about an eco-house build by a couple in Norway. As you can see in the video, a lot of these houses can generate warmth and energy by themselves and leave almost no negative traces. A few of these new houses even have the ability to sustain growth of plants. By doing so the house itself is creating a connection between itself and the outside. Mostly build out of natural and renewable materials, they shape the way we look at modern constructing and living. 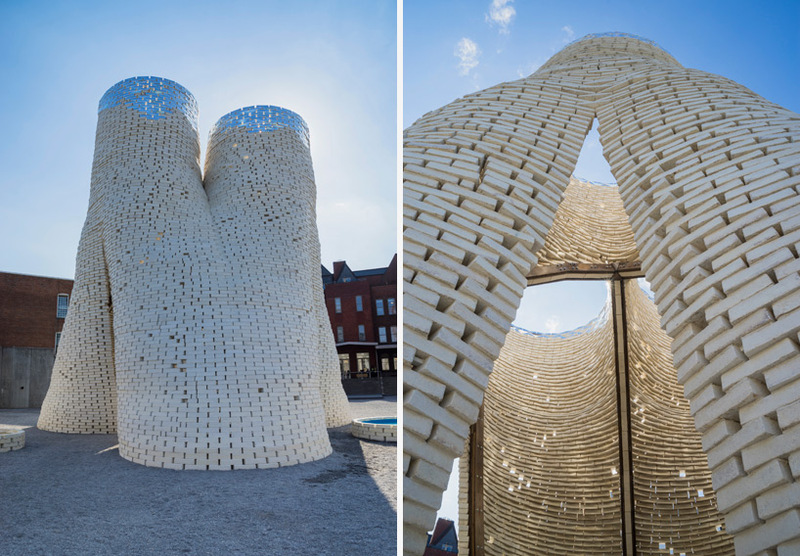 A great example of a material used in a new experimental way is the mushroom that they used to make bricks for the Hy-fi construction of David Benjamins. Having bricks made of mushrooms that can be grown in 5 days, but that can also be easily composted afterwards is a very nature friendly and innovative approach to constructing. It shows us a glimpse of what we might be able to use in future construction of buildings. Thinking about these concepts of sustainability and carbon footprints we also come across another question. Should we think about our plants and animals? Recent architects have been busy thinking of ways to incorporate the outside forces but are now also busy finding ways to cooperate with the life around us. One of the bigger projects that used this way of thinking is that of the Gardens by the Bay in Singapore. A project based on two major elements: human involvement and stimulating nature. One of the keys to this project were the supertrees. A number of man made trees that stimulate the growth of plants on them. Even though this is not about housing it shows us a new perspective and way of looking at construction. So how will we adapt to new ideologies in the future? Will we see self-growing houses or constructions that don’t depend on traditional aspects like walls and floors? Structures that blend the inside into the outside? Blend man-made with natural? In this technological era we might be able to control all these aspects of living a bit more and we have a broader understanding of the outside forces. But as nature is always changing, it’s still not certain if we will be able to control the outside. And if so be truly able to create an outside environment that is at the same time our inside.